As I was doing my removal in the astrals and in the human (the Spirit and Soul) I felt and saw the energy ‘around’ our Spirit is full of Fear – en masse. All the doom and gloom ‘end of time’ crap that has been going around has been for a reason and purpose…in that it has helped and allowed a ‘Resurrection’ energy for humanity collectively! As what has ‘arisen’ is a collective energy of Fear which is a first (in my time of going inwards of 22years, being in 5D for 7yrs and in 6D of 2yrs) that I have seen and felt in the astrals. When I ‘say’ in the astrals, this is having linked my Soul with my Spirit as a Rainbow Bridge for and with humanity. This is very ‘important’ or vital for us growing and ascending here and now. As no longer will just the ‘spiritual’ insight be ‘enough’ for souls. We are needing to link our Spirit to our Soul through our emotions in the human in real-time of being consciously aware of our Inner Divine link to the Divine, that we are part of. 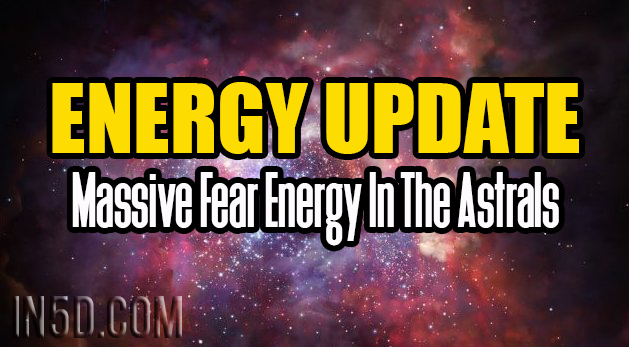 Be ‘aware’ of this energy as it can/has ‘seeped through’ to our energy and will elevate (fear) of any current situation we are in or going through. Yet when we are ‘aware’ of this, then we can understand more of a bigger picture and ‘push through’ this energy or extra energy that is ‘around’. Being tested with the ‘new’ we have just implemented or are implementing – by others of ‘old’ (energy) behavior. Are we going to be conscious and aware OR are we going to ‘fall into an old pattern’? Are we going to say ‘the buck stops here and now’ AND follow through – OR are we going to allow ourselves to be ‘confused’ or affected by someone else’s energy as we may have not realized we have ‘opened ourselves up/our energy’ by not being conscious and aware. As one may have protected their energy but has one ALSO protected their Spirit in the astrals…as BOTH are needing to have protection. This is so beautifully shared in the cards that came below. That we need to ‘push through’ in a positive way of what we are ‘wanting/feeling’ to move forward with, as guided by our Soul that we feel deeply, as part of our Souls Divine Journey. ‘Pushing’ for ourselves in small steps to start moving towards to ‘something’ we are wanting/needing/feeling we are now ‘ready’ for and I mean ‘really ready’ to start anew in our lives, that we feel deeply and passionate about, that we have a ‘fire in our belly’ with. This is also with something we may have had in place or have ‘done before’ that may have tapered off, due to going through so many energies/experiences. Don’t be concerned with the final outcome or the ‘end result’, that is a distraction, it is the actually STARTING in SMALL STEPS that is vital. Any small step, no matter how one may feel it is a small one is a step forward in pushing through! And even then when we do start, we may need to ‘push through’ to continue on as well, and that is ‘okay’ as we may need to ‘fight for ourselves’ in creating the new, step by step. One of the ‘biggest’ areas with this is ‘perfectionism’ and/or the ‘head’ ‘wanting’ to continue in the new of the ‘old ways/methods’. This can cause confusion as in one feeling that are/have taken a or steps forward and then ‘all of a sudden’ ‘things seem’ to be not so clear – again. It is not ‘again’ if one has taken steps forward, it is the old ways and methods that one is/has been ‘so used’ to, coming back up, like an old computer program ‘wanting’ to run on a new computer system. It has a familiar ‘feel’ yet it is not ‘updated’ – energetically – so it does not ‘fit’ with the new vibration one is now feeling or holding, hence the confusion. This is where one needs to be CONSCIOUSLY AWARE of their thoughts and feelings as to what the ‘head’ may be re-playing of the old and how one is feeling as to what resonates now, as to previously. And when I say about our thoughts, it is just having a listen to what one is actually saying over and over, that one is so ‘used to’ that many and I mean many are not aware of the energy of what they are saying and re-confirming to, in and with themselves and putting out energetically as well. When was the last time you actually listened to yourself or monitored what you are saying to yourself? As I can tell you, that just about EVERY SINGLE PERSON that I have a 1:1 Divine healing with, I am gently and lovingly pointing this out. After a year of not being able to go on my walks, due to many reasons, I started this again a few days ago, as this is so beneficial in many ways. It is also ‘my time’ to process and clear energies. Then the last two days I ‘wanted/felt strongly’ to go, yet my routine was that I had not walked in a year. I noticed this and my feeling within that I am finally ‘ready’ again to have my walks, I brought it into my consciousness deliberately, to incorporate this back into my ‘routine’. I brought it to the forefront and sure enough I ‘created a new space’ – again and today I had my walk. Being consciously wide awake and linking our Spirit to/with our Soul is imperative as it allows a bigger or full picture of both Spirit and Soul, the ‘above’ and ‘below’. You’re qualified and ready to take the steps toward your desired outcome. You have what it takes to fulfil your dreams and your life’s purpose. This card signals that its time now to make your move. You can do it!. Take action without delaying or hesitation. No more preparing or procrastination-just do it. You’re a valuable and beloved person. Break big goals into smaller steps and take one step today. You’re on the right path. Let go of perfectionism and know that you’ll do fine. Devote time to your highest priorities, even if I means getting to bed earlier or later. This is a wonderful time to work on projects, that are near and dear to your heart. Even if you’re confused about how to approach the project, or you fear whether you’ll be able to accomplish your dreams, do it anyway. You’ll feel elated by the time and energy you invest into your true priorities because your inner self will feel loved and well cared for. As you invest in your priorities you’re investing in yourself. Let go of procrastination or perfectionism. Break your major goals into baby steps and take one step at a time. Revamp your schedule so that you devote regular time to your priorities. Be assertive in saying no to anything that diverts you from your path. – Ascended Masers Oracle Cards, Doreen Virtue.